The monolithic U.S. 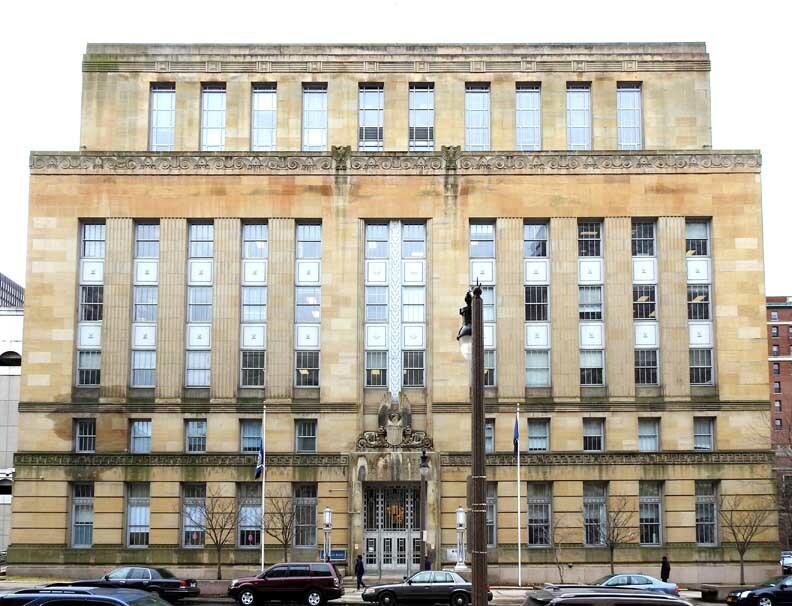 Courthouse in Buffalo, renamed in 1987 in honor of longtime Internal Revenue Service employee Michael J. Dillon, occupies an entire block along Niagara Square, the city's civic center since 1802. 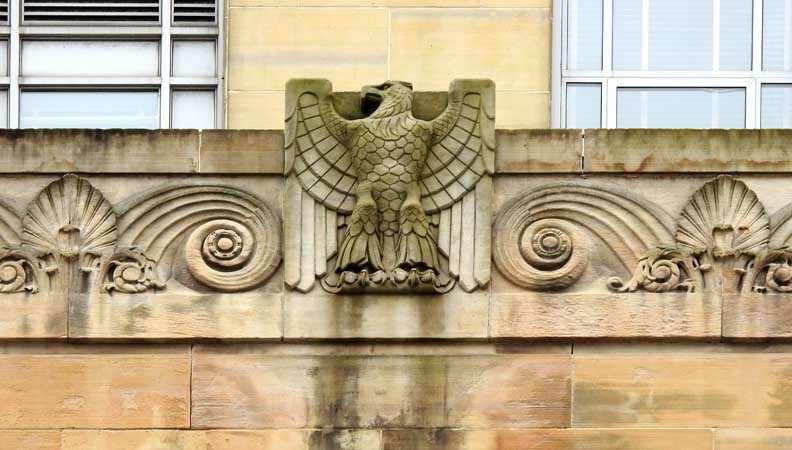 Construction of the seven-story sandstone and steel courthouse in 1936 resulted from Buffalo's evolution as one of the country's most important industrial centers, which brought numerous federal agencies to the city. The courthouse concentrated the federal presence in an excellent example of the Art Moderne[?] architecture favored for government buildings funded by President Franklin D. Roosevelt's New Deal programs. Federal government facilities had become so overcrowded by 1928 that the citizens of Buffalo pressured Congress for a new building to house all Federal offices in the city. The Emergency Relief and Construction Act of 1932 authorized the construction of a number of federal buildings, including the Dillon Courthouse. Under the authority of the 1926 Public Buildings Act, the Supervising Architect of the U.S. Treasury Department was responsible for the design of all federal buildings. Due to economic pressures on small architectural firms during the Depression, local architects received some of these commissions. In January 1933, the Supervising Architect's Office retained two influential Buffalo firms, Green and Sons and Bley and Lyman, to prepare plans for the new U.S. Courthouse. Because of the unusual shape of the site, the architects created a pentagonal building. 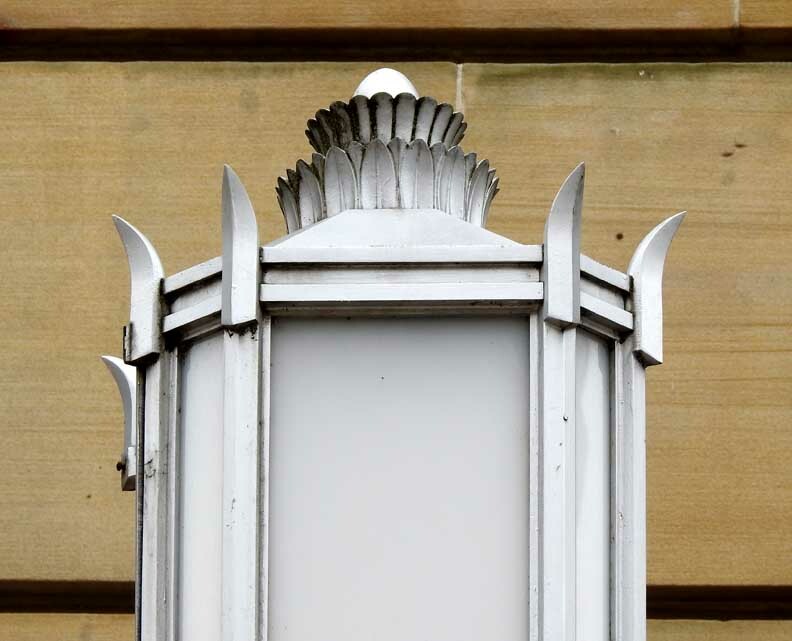 The courthouse is a unique example of Art Moderne[?] architecture because of its unusual shape and low-relief carved ornament. Originally planned as a twelve-story building, limited funding reduced its size to seven stories. President Roosevelt dedicated the courthouse on October 17, 1936 — his speech emphasizing the vital partnership between the Federal government and local officials in creating public works to overcome the devastating effects of the Depression. In 2004, the Dillon Courthouse was nominated to the National Register of Historic Places as a contributing element of the Joseph Ellicott Historic District in Buffalo. The Michael J. Dillon U.S. Courthouse occupies an entire block bounded by Niagara Street, Niagara Square, Court Street, and Franklin Street. Located in the heart of the city, Niagara Square is surrounded by the Dillon Courthouse, the State Office Building, City Hall, and the City Court building. 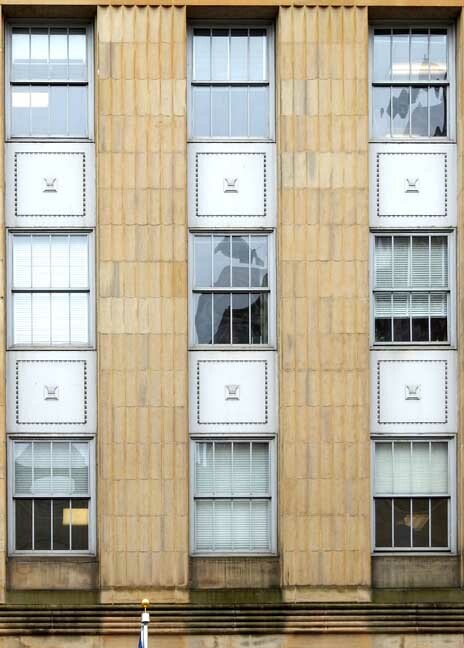 Resting on a granite base, the seven-story courthouse appears as a solid geometric mass of planar, yellow-gray sandstone walls and spare, carved detailing. Each elevation is divided into bays of vertical windows. The handsome carved detailing — emphasizing the building's horizontality — is concentrated at the entries, the first floor level, and building parapets. 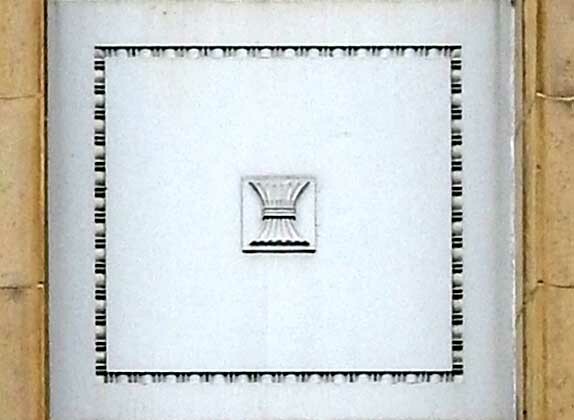 The fluted forms between the vertical strips of windows, on the other hand, resemble classical colonnades and provide a tension with the horizontality of the carved ornament. 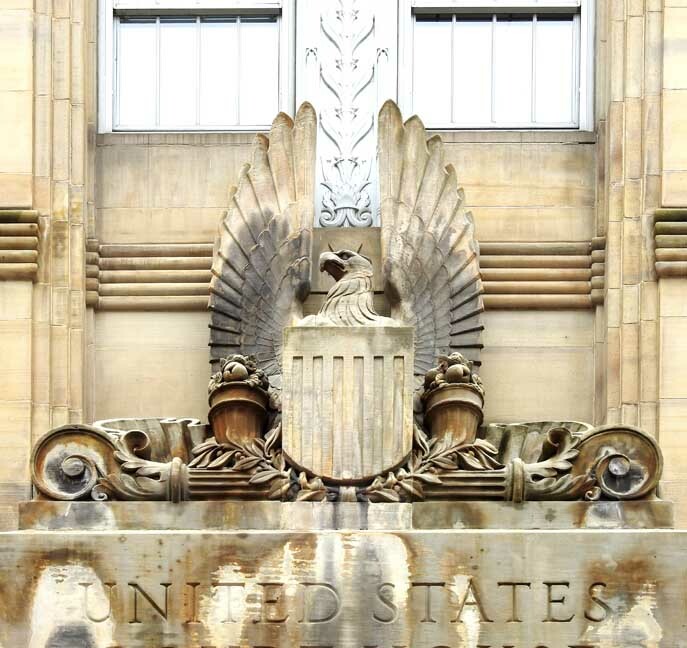 One of the two main entrances to the building, on Court Street, features a smooth stone surround into which is carved "United States Court House." 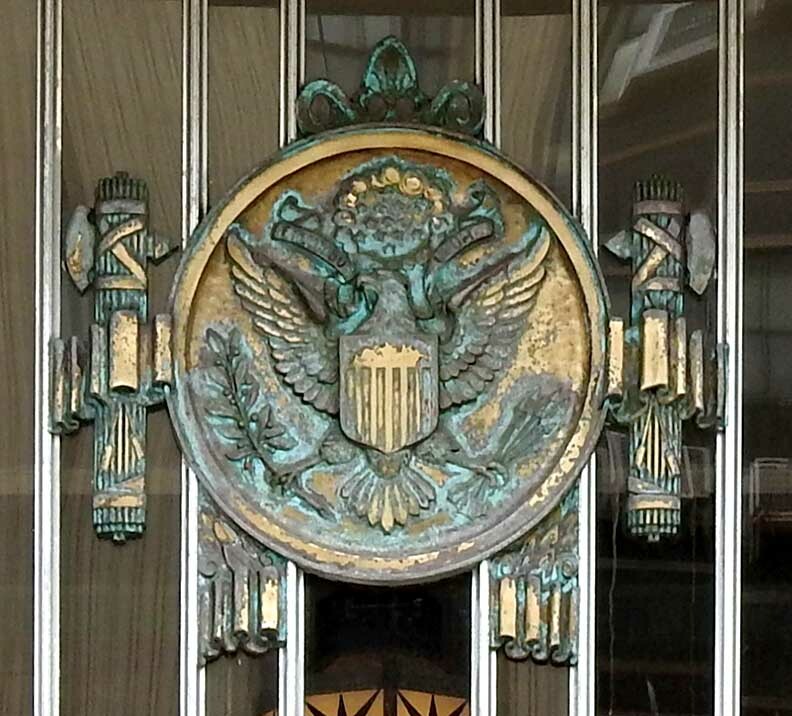 A monumental carved eagle perches above the door surround. 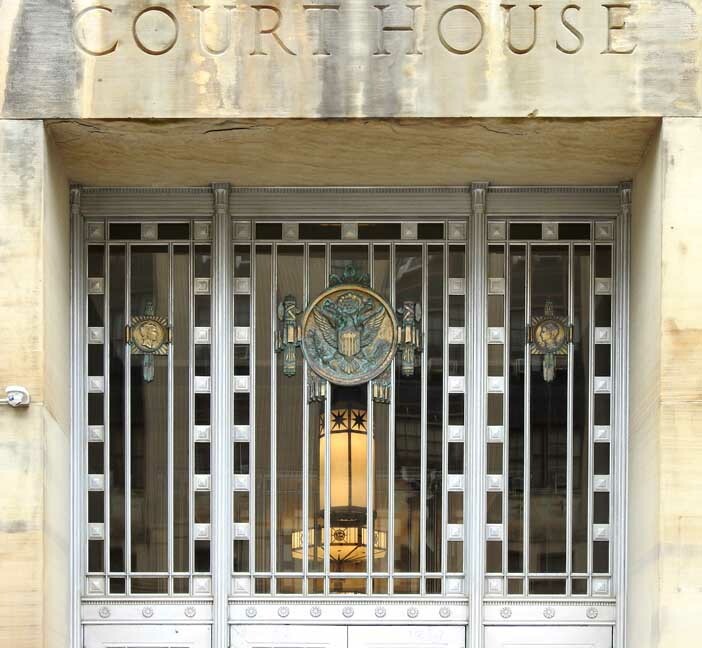 The entry doors, frames, and transoms are cast aluminum with ornamental grillwork. 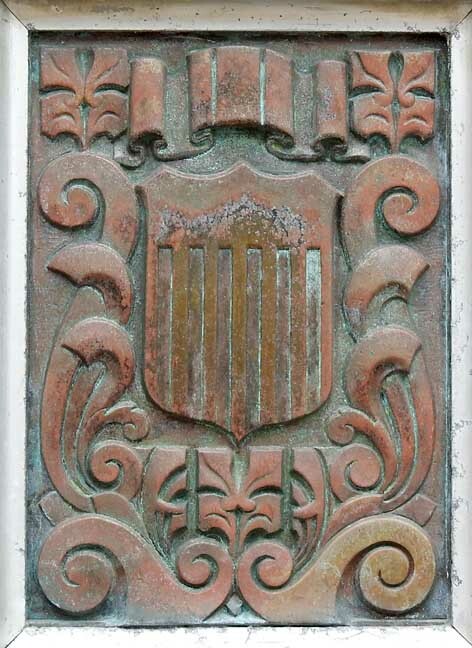 A cast-bronze medallion is centered above the middle door. 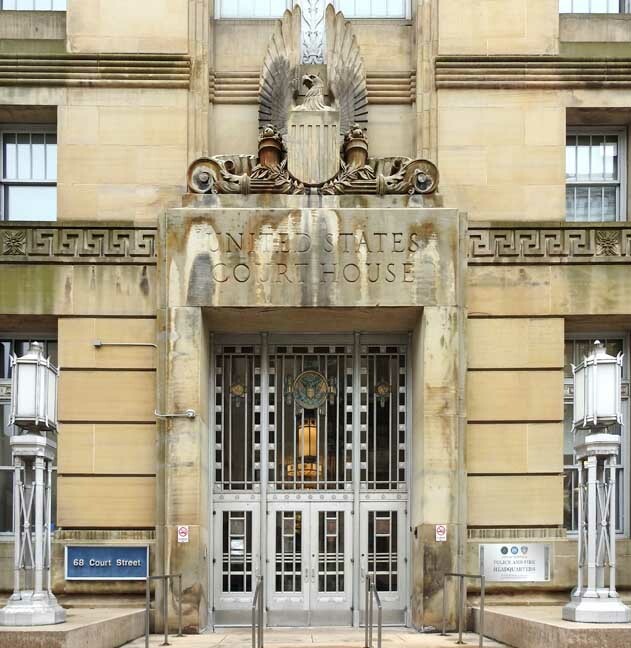 1932: The Emergency Relief and Construction Act authorizes construction of several Federal buildings, including the courthouse in Buffalo. 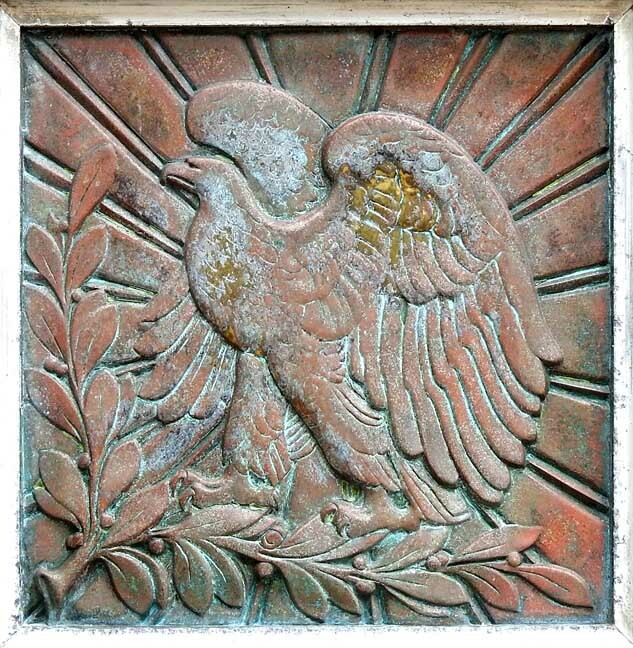 1933: Two Buffalo architectural firms, Green and Sons, and Bley and Lyman, are retained to prepare plans for the U.S. Courthouse on Niagara Square. 1936: The cornerstone of the courthouse is laid and President Franklin D. Roosevelt dedicates the building. 1987: The courthouse is named after Michael J. Dillon. 2004: The courthouse is nominated to the National Register of Historic Places as a contributing element of the Joseph Ellicott Historic District. 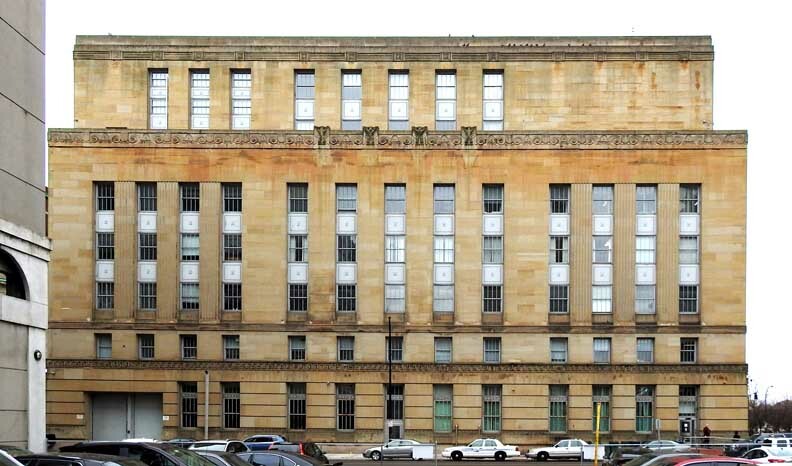 The GSA article reprinted above contradicts the GSA article reprinted below in terms of style for the Dillon Courthouse: Art Moderne style above, but Stripped Classicism, Starved Classicism—or PWA Modern below. Construction for the building was completed in 1936, in general, the decade of Art Moderne style. The style of this building, however, - in my opinion - is not accurately described by Art Moderne. A better description would be "Stripped Classicism, Starved Classicism—or PWA Modern." The Keyes-Elliott Bill, an amendment to the Public Buildings Act of 1926, passes. The bill provides the secretary of the Treasury increased authority for entering into service contracts with private architects. 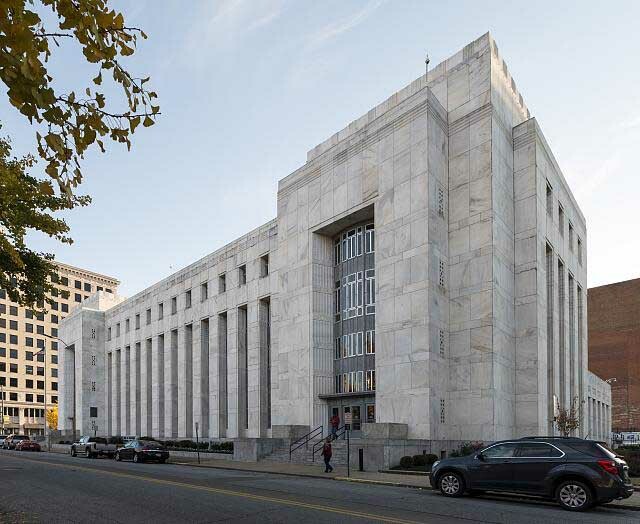 The American Institute of Architects (AIA) begins a concerted lobbying effort for the Office of the Supervising Architect to reorganize as a management organization and cease its federal building design responsibilities. The AIA’s campaign is largely unsuccessful, as the government retains design responsibility for the smaller projects, awarding only larger commissions to private firms. Private sector begins to embrace modern architectural ideals and new building technologies. Examples include Rockefeller Center (Associated Architects) in New York City and the Philadelphia Savings Fund Society building (Howe and Lescaze) in Philadelphia. During the 1930s, the government embarks on a prolific construction program, and federal buildings throughout the country are planned and executed. Many buildings continue to reflect traditional styles, though they increasingly bear the influences of the early modern movement. Used primarily for government architecture, a new architectural style emerges that effectively straddles classicism and modernism. Simplified neoclassical forms are paired with the stylized designs of the Art Deco style. 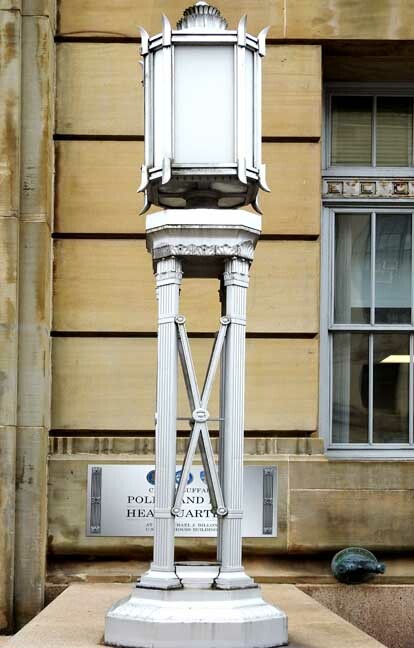 This new public building style is today alternately known as Stripped Classicism, Starved Classicism—or PWA Modern in recognition of the Public Works Administration that oversaw many such designs.